Come and join our Love2Grow Gardening Club for young people to learn more about food and have some fun outdoors. 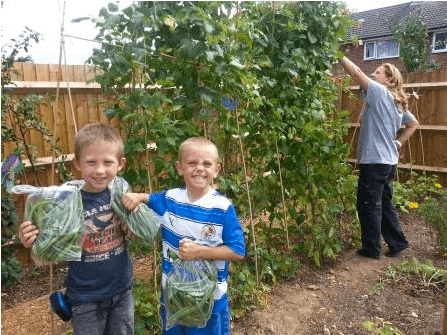 The club is on most Saturdays in term time from 1-3pm at one of our community gardens in Basingstoke. The class is run by a trained Horticulturalist and supported by adult volunteers. This class is open to children from 4 to 16 years. Cost is £2 per child per class. Children learn about basic horticulture skills, including how to sow seeds, plant vegetables, label up plants and much more. We also do a lot of craft and garden art with the children to help develop their creative skills. Inspero’s community gardens are beautiful outdoor spaces where children can learn, socialise, play, grow and develop in a safe, secure, colourful and attractive environment. Hi, I would like my daughter who is nearly 4 years old, to join your gardening club. Can you send me some details please on how to join. Many thanks. Hi Chirashree, the best way to do this is to ask through the Contact page or click on the event of your choice and fill in the details.